D L M Y L O W N N P A R T ? In addition to doing the 3 regular exercises, you will also test your skills milling a model of your own in the workshop of building 427. All groups have 20 minutes together with a milling machine operator, to do the last preparations and the milling. You have a piece of Cibatool material which is 100 x 60 x 25 mm. Within these limits you can design the part the way you want it. Make sure you leave minimum 5 mm to clamp in the bottom. -Tool motion parameters and the material to be removed are defined. 2) Create a new file with settings shown right. Verify you use mm. The file will have an .asm extension. 3) In the Manufacturing pane, choose Reference Model / Assemble Reference Model. 4) Select your own CREO part as the reference model (the part to be produced), and place it in default position. 5) Define the workpiece (the part that represents the block of metal or plastic that is to to machined) as described in the Week 1 tutorial / part 2: Volume milling, page 14 - 15. Extrude the workpiece to the same height (Depth Value, here max. 25 mm) as the reference model. Click the green Apply button. The Workpiece should now enclose the reference model. 6) Create a milling volume as described in the Week 1 tutorial / part 2: Volume milling, page 15 - 22. Determine the deepest point or surface in your reference model ("Z value") the tool has to reach in order to mill the workpiece correctly, and use this as the sketch plane level. 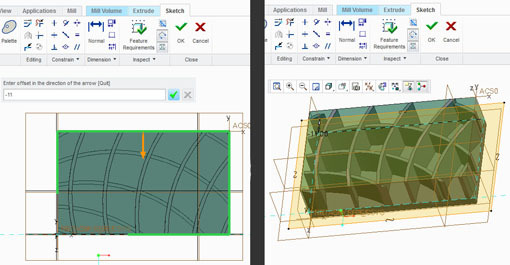 Create an overhang of 11 mm (giving the tool space enough to mill the perimeter surfaces on the workpiece), either by using the Offset command as described on page 21, or by using the Offset sketch tool (shown right) instead of the Project sketch tool. Both are used when you trace the edges of the referance part to define the extrusion of the Mill Volume. If the dimensions of the reference model are changed, the milling volume will follow. 1) On the Manufacturing pane, click Work Center / Mill and in the Milling Work Center box click the OK button for closing the box again (Nothing changed...), thus preparing the system for a 3 -Axis milling session (default setup...). 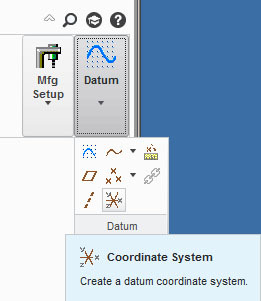 On the top right choose Datum / Coordinate System - The Coordinate System box opens with the Origin pane active. Click on the upper right corner of the work piece (Not the Milling volume!) to define the origin (pict. A). In the box, jump to the Orientation pane and activate the area with the red arrow (pict. B). Click on the top horizontal edge to define the X axis (pict. C). 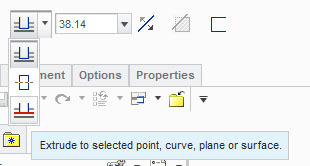 still on the Orientation pane, repeat the above actions to define the Y axis by activating the lower Click here to... button. Use one of the Flip buttons to ensure that the Z axis points upwards - This is imperative! The X and Y axes must be orientated as shown (pict. D). Close the Coordinate System box with an OK. On the top ribbon click the blue Resume button followed by the green acceptance button. Verify that Datum display is turned ON. 1) Go to the Mill pane and choose Roughing / Volume Rough. The Volume Milling pane will appear on the ribbon and needs input values for Tool, Reference, Parameters and Clearance. 2) Click on the Tool icon: the Tools Setup box appears. Here and END MILL tool with a length of 80 mm and diameter of 10 mm has to be defined. Enter the Settings pane and set 1 as Tool number. Apply and close box. 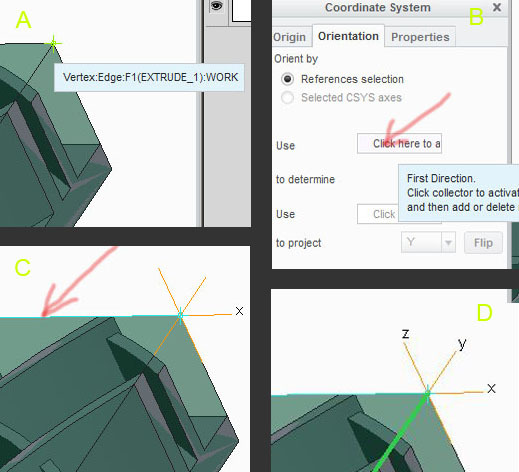 To save time in the toolshop session, click in the Excluded Surfaces field (surfaces to exclude from profiling) and select then (using ctrl) the four vertical walls on the Milling volume(Cyan arrows). Use the Details button to check that all four are chosen. This will reduce the time spent on "machining air"
CLEAR _DIST = 2 and SPINDLE_SPEED = 500. Additionally, set ROUGH OPTION to ROUGH_AND_PROFILE. 5) Choose the Clearance pane, to define the retract level of the tool (The level where it can freely move around in idle state) . For retract reference choose the top surface of the milling volume and type 10 for Retract Distance value. Now choose Play Path / Screen Play under the Volume Milling tab. If all the above is done right, the PLAY PATH player will appear and show you the tool path. Setting display to Hidden Line will show the path more clearly. If you want to inspect the quality of the milling, choose the NC Check icon / Run. This will show the milled surfaces in shaded colors. 6) Finally, with the simulation completed and running the way it is meant to do, choose the Accept icon to save the whole operation. The Volume Milling tab closes, and now the Manufacturing file is ready for the actual milling in the tool shop in building 427. Choose File / Save As / Save a Backup to a suitable destination - Preferably a USB drive. The Save a Backup will generate 4 - 5 files. Use the Organize / New Folder option to keep the files together - they will all be used in the milling process.